Produced by Whittaker and Kettenburg. The Alan Payne designed the 9.6 for Columbia. This boat was eventually produced in three flavors: The original P9.6 built by Columbia at the Virginia plant, the Columbia K9.6 Kettenburg Limited Edition, and finally by Kettneburg as the K32. 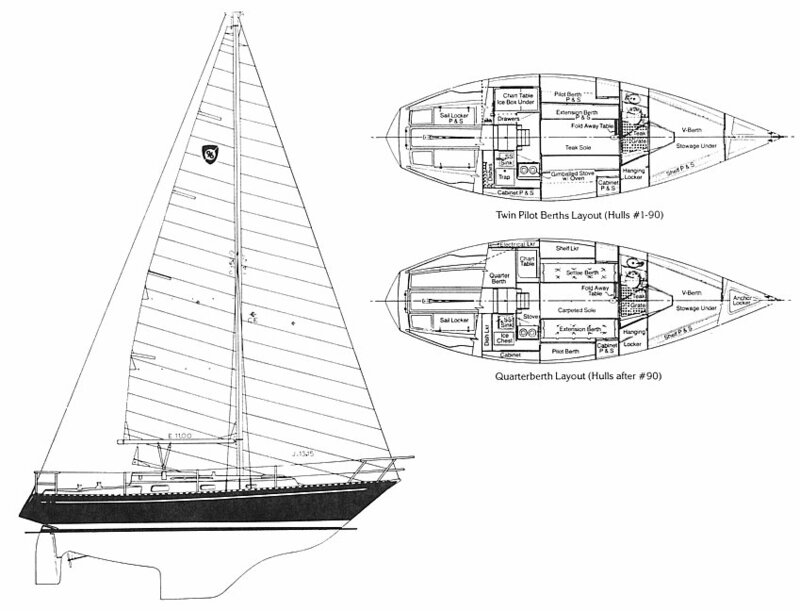 The following specifications and diagram came from a reprint of an article from the December 1975 issue of Boating, written by Larry Kean and John Schieffelin, and from what appears to be Columbia literature, both sources provided by Brian Engelke. The Columbia 9.6 was first offered in early 1976 (possibly late 1975). I have seen references to models as late as 1982. It is interesting in that it is one of the few models given a name (Payne 9.6) and the only model that I have seen named after the designer. Kean and Schieffelin make it sound like this is the first boat designed by Alan Payne for Columbia and this would tie in with the Payne 9.6 name. I owned a Columbia 9.6, hull #6025 -- 25th in the line which was produced in VA. I expect about 180 9.6's were produced. Hughes never got the 9.6 in production. I visited him in May, 1989 in Orangeville, OT and he made repairs to my rudder. He was not producing boats, but had a variety of different Columbia parts and items on sail. All that disappeared in the next year in a fire. So the fire was in 1989 - 1990. According to the article, Columbia tried to break new ground by offering the boat "quite fully equipped" and built to a strict one-design standard. I don't know if this approach was successful or whether Columbia stuck with the one-design concept through the end of the model run. In any case, the design seems to favor racing over cruising. The 9.6 has a "modern racing-type fin keel" with a partial skeg and reverse transome. The first things that struck me when looking at this boat were the sleek profile, short boom, and high aspect ratio sail plan (11' foot x 35' luff). According to the article, the galley is a U shape around the aft end of the saloon - stove, oven and sink to starboard - 8.5 cu. ft. ice chest to port. The center of the counter doubles as the first companionway step. In addition to the usual vee berth forward, the berth accommodations are maximized by using a pair of upper/outer pilot berths over settee berths that pull out for sleeping. Evidently this racing oriented saloon with a settee berth and a pilot berth on each side of the cabin didn't go over well with the typical family. Starting with hull 91, the port side was changed to a more conventional bench and a quarter berth was added aft. I have a copy of a brochure dated March '78 that shows the later arrangement only. But did Columbia redesign the interior - probably not. In 1975 Whittaker Corp., Columbia's parent company closed the west coast plant and moved all production to the Virginia plant. But Whittaker also owned west coast boat builder Kettenburg, which apparently had excess production capacity. Sometime in late 1976 or early 1977 Kettenburg redesigned the interior to make it more "family friendly". The result was the Columbia K9.6 Kettenburg Limited Edition. An article in the September 1977 issue of the magazine "Western Sea combined with Rudder" reviewed the 6th K 9.6. They stated that it was "fresh off the production line". Given normal lead times for magazines, the test could easily have been done in June. All construction was done in California but Survival Systems of La Mesa, CA, another Whittaker company, molded the hull and cabin/deck structures. Kettenburg then installed the interior and completed the boat in their Oxnard plant. ..the designation has been changed to "K 32". The "K 32" is a special "West Coast Edition", the first of a new line of yachts designed by Alan Payne. Along with it is a K 32 Standard Equipment List dated June 1977. The letter is on Kettenburg Marine letterhead and nowhere is there a mention of Columbia. By 1979 Columbia had closed its doors. Hughes had purchased some molds and the name and moved production to Canada. I have yet to see clear evidence that they produced a version of the 9.6. Kettenburg and Survival Systems had the molds and could continue to produce K 32s. I don't know whether they did or not. Justin Thompson has some original Columbia engineering drawings for the 9.6 and he also has owners manuals. Click here for a list of what's available. "This design was influenced by four important considerations. First it was necessary to choose a medium displacement hull rather than the light displacement of the modern racing yacht. This was to allow for the boat having rather more structural strength and more comfortable accomodations than is usual nowadays in racer - cruisers. Secondly, the boat has a hull form with a little more than the usual depth with the idea of combining this with a medium displacement to achieve good headroom and useful cabin space. The design was carefully developed to realize the best possibilities of this moderately V'd form. Thirdly, the hull and rig design was worked over to provide the lowest possible rating under the current form of the IOR rule, without departing from what was needed to meet the first two requirements. Since the boat was intended for one-design racing, there was perhaps no great need to take note of IOR influence. However, it is an advantage for the boat to have a chance of success in IOR events, and of course the IOR rating is a commonly accepted yardstick of performance. This boat is "fast" by comparison with her rating, and we think this will be a source of satisfaction to owners. Fourthly, in a way this might have been the most important consideration, my aim was to design a boat in sensible proportion, with no one feature exaggerated at the expense of others. I have tried to produce a boat truly enjoyable to race and enjoyable to cruise. This is what is wanted for a successful one-design class." I have the original bill of sale for my 1979 9.6 meter, written at the January '79 boat show here in Minneapolis. It shows the base price of the 9.6 at that time as $38,340. Option prices included: Teak cabin sole @ $353, Opening ports @ $85, Offshore volves @ $180, Hot/cold pressure water @ $820, Shower @ $379, and 2nd battery @ $93. Sails (Mail, 110% and main cover) were $1,764. So the total with these options was about $42,100. Only the first 99 9.6's had internal halyards and tapered mast. After that they went to conventional rigging.